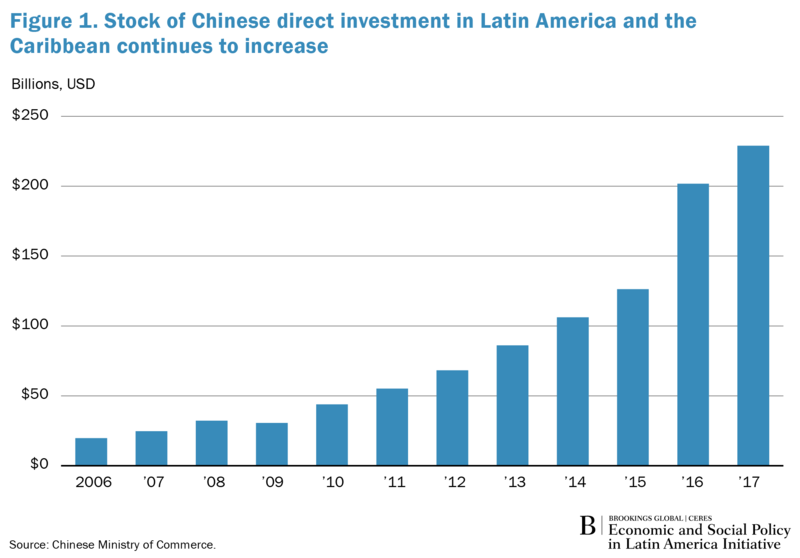 Despite ongoing cyclical and structural changes in the Chinese economy, trade and investment relations with Latin America remain solid (see Figure 1). The main surprise from the Chinese economy in 2017 was that it was a more significant source of demand for Latin American products than had been expected, but a less significant source of capital for the region. China’s GDP growth accelerated modestly in 2017 for the first time since 2010 and reached 6.9 percent for the year. Consumption was the main driving force, which shows a healthy rebalancing of China’s economy away from exports and investment. Still, exports and investment both contributed to growth. World trade picked up unexpectedly in 2017 and China saw double-digit increases in both imports and exports. China’s demand for imports, especially for energy, metals, and food, drove price increases for these commodities, although not to the extraordinary levels seen before 2014. Although domestic investment is naturally slowing in the face of excess capacity in real estate and manufacturing, the Chinese government managed to keep investment growth at an acceptable pace through infrastructure spending at the local level. As a result, infrastructure’s share of total investment rose above 20 percent, higher even than during the big stimulus introduced in the aftermath of the global financial crisis. One worrying sign in this overall rosy scenario is that debt-to-GDP continues to rise at an unsustainable rate. The Financial System Stability Assessment published by the International Monetary Fund last November emphasized that leverage in the economy is on a linear ascending trend that will take total debt above 300 percent of GDP in a few years. Particularly worrisome are the growth of corporate debt as well as the marked increase in local government debt. Local governments borrow to finance infrastructure investment; the ability of some of them to service these debts is very much in question. The IMF recommends increasing capital buffers in both big banks and small, reining in the overall growth of credit in order to stabilize leverage, and strengthening the independence and capacity of regulators. While financial warning lights are blinking, China has some characteristics that reduce the risk of a financial crisis and give the government time to deal with emerging issues, provided that the leadership summons enough political will. These features include a high domestic savings rate that reduces the country’s dependence on capital inflows, a state-owned banking system that largely lends to state-owned entities, effective capital controls, and a reserve stockpile that that has declined from $4 trillion to $3 trillion but remains very large. Until 2016, China had been an increasingly important source of capital in the world economy. The two main vehicles were outward direct investment (ODI) and lending for infrastructure from China’s two big policy banks, China Development Bank and Export-Import Bank of China. It is natural for China to become a supplier of capital at this stage of development. Its extraordinarily high savings rate is starting to come down, but slowly; meanwhile, the investment rate is coming down as well in the face of diminished profitability and fewer domestic investment opportunities. China’s current account surplus—the difference between saving and investment—has been fairly stable in recent years at around $200 billion. China prefers to keep both its trade-weighted exchange rate and its stockpile of reserves approximately constant, which requires a net capital outflow of around $200 billion to match the current account surplus. During 2015, China’s capital outflow exceeded that level. Many state-owned and private enterprises began investing abroad. The government encouraged the policy banks to lend overseas for infrastructure. As the large outflows put downward pressure on the currency and reserves began to decline rapidly, an expectation of currency depreciation arose that encouraged even more outflows. The government fended off any significant depreciation by using reserves to stabilize the market and tightening capital controls to manage net outflows. During 2016, the government implemented regulations that discouraged investment in activities such as football clubs, casinos, and high-end real estate. On the other hand, it encouraged outward investment in energy, metals, food, and high-tech manufacturing. Looking at China’s overall ODI, after years of steady increase, in 2016 it declined by about one-third from the year before. While Latin America is strong in some of the resource areas favored by China, the region still received less Chinese direct investment than had been anticipated. China’s overseas lending for infrastructure has held up well, but it is not on the scale suggested by some of the media hype. China is secretive about lending by its policy banks, not disclosing which countries are borrowing, for which projects, and on what terms. AidData has put together data on China’s overseas lending through 2014 based on media reports and follow-ups with China’s ministries and embassies as well as recipient countries’ reporting systems. Between 2012 and 2014, China was lending about $40 billion per year for infrastructure to the developing world, mostly for transport and power generation. China branded this program under the rubric of the Belt and Road Initiative, that is, the restoration of the overland Silk Road from China to Europe as well as a “maritime route” from China past South Asia and on to Europe. Despite this branding, there is in fact no discernable geographic pattern to China’s lending. Africa has received more financing than developing Asia. Latin America has been a major recipient as well, especially Argentina, Ecuador, and Venezuela. In all regions, there have been highly publicized projects that never got off the ground. In Latin America, the Nicaragua Canal has seen no activity in recent years, and the proposed rail from Brazil across the Amazon and the Andes to the Pacific Ocean has also not progressed. However, overall lending from Chinese banks to Latin American governments and parastatal entities remains significant. One of the characteristics of Chinese lending globally is that it is uncorrelated with measures of risk, such as indices of property rights and the rule of law or of political stability. However, it is not the case that Chinese financing is deliberately targeting poor governance. Rather, Chinese lending is indifferent to governance. It should come as no surprise, then, that some of China’s biggest clients are running into debt sustainability problems. Globally, China’s 20 largest borrowers saw a significant increase in external debt-to-GDP over the past decade, whereas the rest of the developing world experienced little change. In Latin America, Venezuela is the obvious case in which Chinese financing has enabled the government to amass an unsustainable level of debt. Overall, China continues to be an increasingly important economic partner for Latin America and the rest of the emerging world. Although some of the hysteria about Chinese financing was out of touch with economic realities, Chinese investment—both direct in resources and lending for infrastructure—is likely to be increasingly important for the region.